I almost didn’t have a Christmas tree last year. Whether it was laziness, crazy schedules, or just flukes of nature, somehow it was December 22nd and there wasn’t a single pine needle in the house. We just hadn’t had the chance to shop for a Christmas tree. We tried once, but the Christmas tree lot was closed (is that even legal in the week before Christmas?) 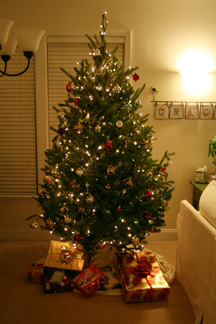 So that night – on a very, very cold night – the four of us piled into the truck and went on a mission to find a Christmas tree. 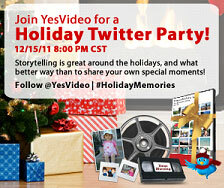 If you have a holiday memory that you would like to keep and preserve, then make sure you join YesVideo for their Holiday Twitter Party. The party will be on December 15th at 8PM CST and will have some amazing prizes – ranging from a Sony BluRay Player to a FLIP HD video camera. 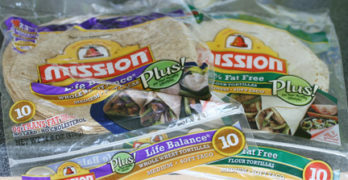 Make sure you RSVP for the Twitter party before hand and fill out the form to be eligible for the door prize! YesVideo is a service that allows you to transfer your home movies and videos to DVD or Blu-Ray. YesVideo can take your videotapes, slides, digital photos and more and convert them to your very own DVD. If you have been taking HD video with your phone or video camera, you can convert those to Blu-Ray! This is a great way to preserve and share your holiday memories.